Liz Carter’s ‘Catching Contentment’ has been one of the best books I have read in such a long time. She writes from the heart of what it means to be contented, even when all of our circumstances can be screaming at us to be the opposite. Liz has a chronic illness – a rare lung disease – which often leaves her with fatigue, breathlessness and chest infections, bringing her into hospital or confined at home. Even on the publication day of this magnificent book, Liz was once again taken ill and missed the launch of her book and all of the immediate celebrations of her well-deserved success. If Liz can find contentment in all of this, then can she help me? The answer is – yes. Liz explores contentment through the four C’s that she discovered through her own life, by examining the Scriptures as well as the experiences of other Christians throughout history. There is confident contentment – what it means to be confident in our faith, identity, hope and future; courageous contentment in waiting, in brokenness, in disappointment and in perseverance; captivated contentmentthrough worship, satisfaction, darkness and surrender and contagious contentment that looks outward rather than inward and transfers this to others, rather than discontentment. A warm, relateable style of writing. It really does feel like you are walking with her each day as a friend. The short paragraphs are easy-to-read, conversational and keep you focused on the Lord in a fun, relaxed way. A stunning cover. I know we shouldn’t judge a book by its cover, but having this on your bookshelf is a reminder of the great content that is inside it. A mixture of bible passages to reflect on and the author’s own thoughts. Interspersed throughout, there are days where there is just a passage of scripture and four questions to reflect on: What does it say? What does it mean? What is God saying to me? How will I respond? This is a great way to really slow down and meditate on the words. A short prayer at the end of Catherine’s own reflections. These prayers are only couple of lines long, but they capture the heart of what the reading has been been about. It’s a great way to finish each daily devotion. A verse at the top to start followed by a reading to go and look up. We are invited to open up our own Bibles to look at the reading that surrounds the chosen verse that Catherine has picked out for the day. It’s always great to look over a verse, but it’s helpful to see the context of that verse and ponder it for ourselves, which is exactly what Catherine helps to facilitate. 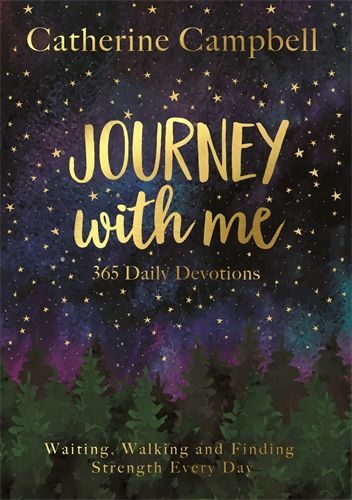 You can purchase ‘Journey With Me’ (published by IVP) for £12.99 at Bridge Books by placing an order on our website, giving us a call on 01392 427171 or visiting us at 3 Okehampton Street, Exeter, Devon, EX4 1DW. Grow Magazine included Bridge Books as an independent bookshop rising above the high street slump. With approximately 85,000 people losing jobs from Britain’s high streets, the picture of retail shopping is changing and it seems to be painting a bleak picture. We celebrated our 10th anniversary of Bridge Books in 2018 and aim to have an excellent service for all our customers. This article in Grow’s online magazine is an encouragement for all of us and it is great that independent bookshops are flourishing in the local area. Did you see Bridge Books featured in the August edition of Exeter Life magazine? We were delighted to be featured alongside many other people within our city and it was great to continue celebrating our 10th anniversary in this way. It highlighted some of the work that we do across the South West from our pop-up bookstalls to our donations to libraries. Of course, none of this would be possible without the continued support of our customers - thank you for being a part of the journey so far! 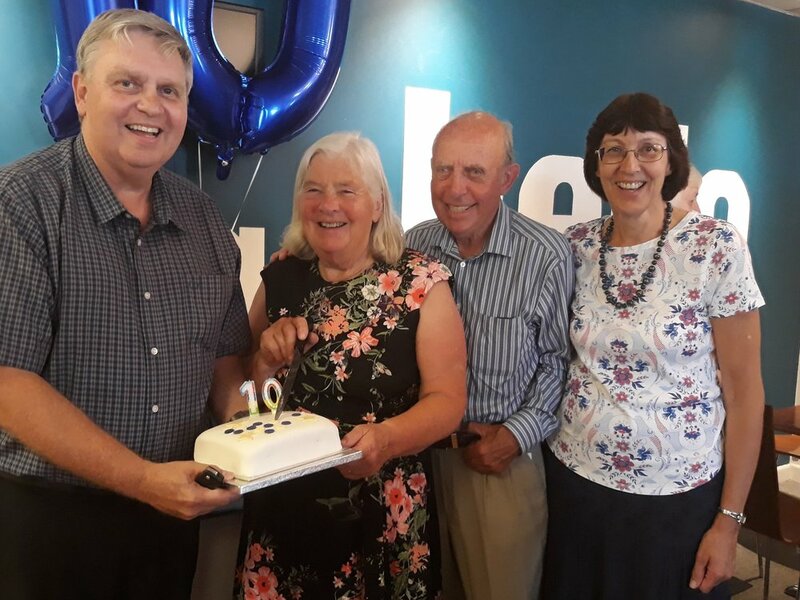 Over 60 people attended the shop's 10th anniversary party including John & Margaret Robertson who opened Bridge Books in June 2008. It was a great encouragement to us all, with food and conversation before heading over to the shop for a time of prayer. "It was such a privilege to be part of your anniversary tea party and to hear about the shop’s back story. Thank you for the invitation and for ensuring a lovely welcoming atmosphere. We really appreciated being there, chatting to others and understanding a little more of your ministry." We are continuing the celebrations by offering our customers a beautiful gift book every day in July as a special thank you. Also, for any church group or school who buy ten items, we will be giving another one for free (valid until 30th August 2018). Please come and visit - it's always a joy to see you! To find out more about what's been happening at Bridge Books, please do read our latest newsletter by clicking here. We are looking forward to having 'Freed From Shame' authors Dawn Holmes and Karen Todd speak at Riverside Church (next to Bridge Books) on Saturday 16th June from 10:30am-12pm. We had the privilege to catch up with Dawn for a special interview - we hope this will be a nice introduction to whet your appetites before the main event! Tell us a little about how you came to write the book. I started writing the book after having some mental health issues myself, within my family and friends, and general conversations about what the church is doing to support people. I realised that some people were feeling quite disillusioned with the church’s response, so I began to look into it a bit more. About 18 months ago I set up an online survey just to see if the responses were the same as my friends and family. We had 175 surveys back that were anonymous and the majority were saying again that they were quite disillusioned and they didn’t feel supported, they didn’t know how to ask for support. Not everyone was blaming the church, but there seemed to be a lack of knowing what to do on both sides. Out of that online survey I started writing the book. How did you come to work with co-author Karen Todd? I got so far with the book and I started realising I needed to find out how to publish it. So I just prayed ‘God, you’re going to have to sort this'. That weekend I went to a conference and there was a lady on a stall who had self-published her book and I asked her how she went about this. And she said ‘haven’t you seen the stall next to me?’ On the next stall was Karen and her husband with a big sign on the table saying ‘Do you need help publishing your book?’ And that was that! I talked to her and she was very excited – she had been looking into mental health and the church’s response for a little while as well so we met up after that. 'Freed from shame' - why this title? Right at the beginning I had the word ‘shame’ in my head and I didn’t know how to put that because I didn’t want the book to look like we should be shamed if we’re suffering with a mental illness. I decided to stick with the word ‘shame’ but to change it to ‘freed from shame’. There's a story about the front and back cover isn't there? We played around with a few front covers and I always had a picture of a person with their head in their hands, that they were feeling shamed, but again I felt that wasn’t right to get across the purpose of the book. Actually it’s OK not to be OK and it’s OK to be in a church and not be OK. So the front cover of the book represents everybody as just the same; you couldn’t pick out who out of those people has a mental illness. On the back of the book we’ve greyed out some of the people - almost 1 in 4 of those people on the back cover are greyed out and that’s how they feel. People who are struggling with mental illness can feel like they’re either invisible, or they stand out too much, or that they’re ignored, or that they are making too much of a fuss, that they’re attention seeking. The front cover was the end product – they are freed from their shame because we’re supporting people and making them feel OK and it’s OK to struggle. Tell us a bit more about the research that you carried out. The research seemed to go really well. I obviously didn’t know whether I’d get just one or two replies or whether I’d get loads. There were 175 responses which was great because there seemed to be a wide selection of male and females, different ages, from different types of churches. The one thing that I regretted was that I couldn’t ever go back to them because it was anonymous. I might have had some questions to follow through but I couldn’t because I didn’t know them. That’s the nature of an anonymous survey! At the end of it I put if you want to share with me any further, please get in touch. That’s where the stories in the middle [of the book] came from – people shared further. It was just such a privilege to talk to people and they’re bearing their very souls. They may never have told anybody else ever how they really felt. To start with it felt a bit of a struggle – do I want to put myself in this position to hear these heart-wrenching stories - but actually it was a privilege. I made some friends through it as well. Did anything surprise you or stand out about the research of the stories? I’d never really thought about how people felt when they were suicidal. That was my biggest learning curve. I’d never understood how people could get to that drastic point and why they felt like that. Actually talking to people who had suicidal thoughts and were still perhaps feeling that way or had gone through that and [were] able to share with me their journey through that was quite revealing. It doesn’t help people to keep quiet – it helps people to give them a chance to talk about how they’re feeling. That’s what prevents a lot of the successful suicides is someone’s bothered to talk to them about it and listen to how they're feeling. Just the action of talking can make someone change their mind. What advice would you give to someone struggling with their mental health? Talk to somebody. You can have that fear of the stigma and the shame that will then stop you speaking out because you don’t know how someone is going to react and you’re unsure - perhaps if you’re a Christian, if your church is going to accept you with it. By doing it both ways – by them talking and then by the church or individuals listening and showing some understanding, that’s huge for somebody. It might not change their mental state but to have someone bother to listen to them is a big deal. It works both ways. The person has to be prepared to talk and share and the people listening and supporting have to be prepared to ask questions and listen. What advice would you give to someone looking out for someone with mental illness? Open the conversation. It doesn’t hurt to come alongside someone and ask what it’s really like – 'I don’t understand but tell me what it’s like for you'. They may never have had anybody allow them to speak in that way and that’s freeing for them as well. What advice would you give the church? Open up that conversation. From the front talk about it’s OK to not be OK or anybody from the front sharing their struggles – it immediately puts people at ease that actually ‘I don’t need to put on a mask and come to church' or 'I don’t need to stay away from church until I’m better’ which is how some people feel. Just open up conversations whether that’s from the sermon at the front, during prayer times, Individual people in the congregation – just don’t be afraid to talk about it. And practically, the welcome team – that first person that person meets when they come through the door is going to make a huge difference if they’re welcomed and comforted and they’re told ‘don’t worry if you have to leave part the way through, that’s OK’ and ‘don’t worry if you want to sit at the back if you feel unsure’ and ‘don’t worry if you need to go out to a side room because you’re too overwhelmed’. Those practical things make a huge difference. There is a small charge of £6 per person to cover the costs and refreshments. Plus, the opportunity to buy the book for £7.50 instead of £8.99. Do tell others about this event and we hope to see you there! Engaging creatively with a particular word or verse of Scripture helps to fix it in your mind. Looking back over a Bible filled with dated, illustrated or annotated passages can give real encouragement to your devotional life. A dedicated Bible or journal gives you the freedom to experiment with Scripture; whether you draw stick figures, trace an image, use stickers or glue images cut from magazines in the margins - it’s your own personal expression of time spent with God’s Word. Why not start the New Year with a One Year Creative Expressions Bible which helps you read through the Bible in 12 months? It includes line art to colour and lightly ruled margins that give space for developing imaginative ideas. Dip your toe in the water by starting with the book of Psalms using a wide margined Psalter or a devotional including images to colour. Plus, there is the possibility of more workshops to come - why not add your name to the growing list of those to be notified? The Bible is more accessible than ever before here in the UK. You can now get different translations to help you engage and understand it. It has been translated into many different languages. There are Bibles that can be coloured in or used for journaling; many have pictures or provide additional study notes to give you a deeper appreciation and knowledge of what has been written. Many people own more than one or use an app on a smartphone which skips to the exact book, chapter and verse that is needed. However, there is something pretty amazing about flipping through a hardcopy of this incredible text. Here are just three remarkable reasons to read the Bible – there are many more! 1) It points to Jesus - it’s God’s Word to us. When we spend time reflecting on what has been written in its pages, it deepens our relationship with God and we can know Him better. Also, from the beginning in the book of Genesis to the final book of Revelation, there is an overarching narrative that runs throughout the Bible – it all points to Jesus Christ. If we are only looking for Jesus in the New Testament, we are missing the richness and excitement that unfolds right from the start. 2) It’s not about us - the Bible teaches us how to live and how to obey and trust in God. With the uncertainty that life often throws our way, we can know God’s heart for our lives. It deals with some of life’s toughest questions like suffering, life’s purpose, death and life after death. It’s not a book about us – it’s about the Living God. It’s where we can know God and see His love for us. As we read the Bible, it has the power to transform us. 3) Don’t take it for granted - in many parts of the world accessing a Bible is extremely difficult. Owning a bible could result in persecution, imprisonment and even death, yet many risk their lives for it. We are free to buy, open, read and share the Word of God in this country and so let’s not take it for granted. At Bridge Books, we are passionate about the Bible and have a variety of different translations available in store. We would love to encourage you to engage with the Bible; maybe you own one somewhere, but it’s a bit dusty. Perhaps you have worn out your existing copy and it’s time for a new one. It might even be the first time you have considered reading or buying a Bible for yourself or maybe you would like to buy one for someone else. Whatever your situation, we would love to help you know what Bibles are available to you. Please feel free to give us a call on: 01392 427171 or email sales@bridgebookshop.co.uk or pop into the shop and we can show you our full selection or order it in for you.